Although the concept of maximal oxygen uptake (V̇O2max) was conceived as early as 1923, the criteria used to establish whether a true V̇O2max has been attained have been heavily criticised. Consequently, an improvement in the methodology of the existing criteria, or development of new criteria, is required. 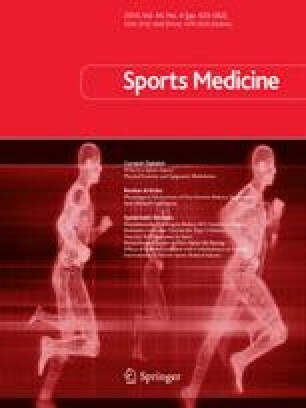 In order to be valid across experimental studies, new or improved criteria need to be independent of exercise modality, test protocol and subject characteristics. One procedure that has shown potential for yielding valid V̇O2max criteria is the verification phase, which consists of a supramaximal constant speed run to exhaustion performed after the incremental phase of a V̇O2max test. A peak oxygen uptake (V̇O2peak) in the verification phase that is similar (within the tolerance of measurement error, e.g. within 2%) to the V̇O2max value attained in the incremental phase would indicate that a true V̇O2max has been elicited. Verification of the maximal heart rate would also indicate that a subject has given a maximum effort. Although the validity of the present methodology for identifying an oxygen uptake (V̇O2) plateau is questionable, a V̇O2 plateau criterion based on the individual slope of the V̇O2-work-rate relationship should improve its validity. This approach also allows determination of the ‘total VO2 plateau’, which is in contrast to currently used V̇O2 plateau criteria that are based on the difference in V̇O2max between only two test stages or V̇O2max data points. The ratings of perceived exertion scale has been criticised for being a one-dimensional measure of physical effort and V̇O2max criteria based on a multidimensional psychophysiological approach should increase validity. Visual analogue scales can be used to assess aspects such as muscular pain, determination and overall perceived effort. Furthermore, they are easy to complete and have demonstrated good reliability and validity in clinical and health settings. Future research should explore these and other potential approaches to developing new or improved V̇O2max criteria, so that, ultimately, a standardised set of V̇O2max criteria can be established. At present, however, the greatest challenge is identifying V̇O2max criteria that remain valid across studies. No sources of funding were used to assist in the preparation of this article. The authors have no conflicts of interest that are directly relevant to the content of this article.